Posted on Sat, Feb 11, 2012 : 5:28 p.m.
Ann Arbor officials announced Friday that plans to build a multi-modal Fuller Road Station have been halted after a federal funding requirements changed the assumptions about financing. The University of Michigan, a partner in planning a $40 million parking structure as part of the development, is now pursuing another option for building a facility for additional employee parking. The city, meanwhile, is reorganizing its approach to developing the site as a train and bus station. Christoper Taylor, a City Council member representing Ward 3, sent a letter to his constituents on Saturday, explaining aspects of the change. "The change regarding match eligibility has killed the current proposal, but the need and effort to bring a new station to Ann Arbor remains very much alive," he wrote. "Many have worked long and hard on Fuller Road Station. We now know that some of that work has been for naught and that is deeply frustrating, but much of that work will continue to pay dividends." Major John Hieftje also said as part of Friday's announcement that the city would continue to pursue the Fuller Road station. I am writing to inform you about important developments regarding Fuller Road Station. The University and the City have suspended discussions regarding Phase I (Parking) and now the City is moving forward to attract the federal rail dollars necessary to build Phase II (Rail). Although these changes will slow and complicate the process, I remain optimistic that this needed piece of transportation infrastructure will be built. As many of you know, Fuller Road Station is a proposed multi-modal transit center to the south of Fuller Road, down the hill from the University of Michigan Medical Center - land that has been leased to the University for use as a parking lot since 1993. For at least two years now, the University of Michigan and the City of Ann Arbor have worked together to design a multi-modal facility that would address the University’s parking needs and create a modern train station to support higher speed rail and commuter transit. As I’ve discussed with you before, the proposal to create Fuller Road Station was viewed by proponents as synergistic. The plan was to have the University pay for the construction of City-owned, University-used parking, with those construction monies later being available as the local match for a federal grant to build the train station. In this scenario, the University would have satisfied its urgent need for Medical Center parking, while the City would have built a train station for next to no money down. Opponents discounted the likelihood of rail traffic coming to Southeastern Michigan and viewed the proposal as an improper constructive sale of parkland to the University. These proposals have now changed. The City had in the past been coordinating with the Federal Transit Authority. Recently, however, we were instructed to instead interface with the Federal Rail Authority (“FRA”). This change has on the one hand been fruitful - the City has been awarded a $2.8M grant from FRA to conduct environmental assessment and design work for a new station, both of which are prerequisites to receiving federal construction dollars. On the other hand, we have been told by FRA that pre-award construction monies cannot now be used for the federal match - in other words, any money spent by the University to build a parking structure could not be used as local match for a federal grant. The City and the University worked in earnest to keep the current proposal on track in light of this new information, but in the end it was not possible. The change regarding match eligibility has killed the current proposal, but the need and effort to bring a new station to Ann Arbor remains very much alive. Many have worked long and hard on Fuller Road Station. We now know that some of that work has been for naught and that is deeply frustrating, but much of that work will continue to pay dividends. Improved rail service will come to Michigan. The State recently has purchased the Norfolk-Southern rail lines, which will enable the construction of a second track parallel to the existing line as well as other infrastructure and track improvements that will make passenger rail practical. Just this past week, Amtrak announced that it had received permission to run trains at 110 mph in the crucial Kalamazoo - Porter, IN corridor. 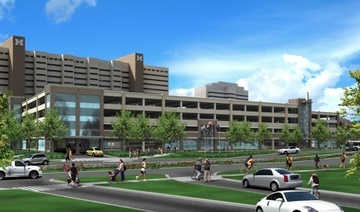 A multi-modal facility at this location is considered ideal by transit professionals due to its proximity to Ann Arbor’s downtown and the University’s Medical Center, which employs more than 20,000 people daily and is Washtenaw County’s most visited location with over 2M visitors per year. The City has received important letters and indications of support from Amtrak and the Michigan Department of Transportation. Ann Arbor still has the momentum and means to win federal monies to build at Fuller Road. Over the next few months, the City will spend its FRA grant monies to analyze and advance the project. At the completion of that process, there will be a new multi-modal design available for public discussion and evaluation. That design will include parking appropriate for a multi-modal facility, but it will not be designed to provide Medical Center parking on the same scale as before. After that public engagement and once we all together settle upon a design that wins FRA approval, I am confident that the City successfully will work with the State Department of Transportation, Amtrak, AATA, and the University of Michigan to create a financing plan sufficient to satisfy local match requirements without strain to the City’s budget. I believe that we will receive this operational and financial cooperation not because these other entities are altruistic, but because each of these organizations has a strong self-interest in the success of Fuller Road Station. For us in Ann Arbor, the environmental, economic, and quality-of-life benefits of a properly placed, fully functional, multi-modal transit station are simply too compelling to ignore. I look forward to continuing to work towards that end. Tue, Feb 14, 2012 : 12:11 a.m.
Councilmember Taylor will appear live on CTN channel 19 Wednesday, February 15th from 7 to 7:30 to address this and other topics of current interest. This will be a live show and phone calls will be taken. Sun, Feb 12, 2012 : 11:20 p.m.
Sun, Feb 12, 2012 : 4:23 p.m. If anyone wonder why I think a development at a train station would work, think about this: 1) You're looking to rent office space in Ann Arbor, and some of your employees hate driving in from the Detroit 'burbs. But if that commuter rail ever gets going, they can get off at the platform, and go up the stairs/elevator and be right at the office. 2) You're coming into town from Chicago for business/UM football games etc., looking for a place to stay. You're taking the new high-speed rail, and wouldn't it be nice if you didn't need to take a taxi to the hotel? Just go up the elevator with your bags. 3) You're an employee working in Ann Arbor, and you just took the shuttle bus to the station for your ride back home. Hey--you can go shopping or get a coffee while waiting for your train in the in-station stores. Obviously I'm being a little optimistic that the high-speed rail and commuter rail get going, but if they do, I truly believe retail, restaurants, hotels, and offices could be extremely successful, and could command high rents to pay back the project. To hedge our bets we could build the thing in phases as rail services improve. The good thing about the existing station + Michcon property is it doesn't all have to be built at once, plus it doesn't eat up parkland. To those who say the Fuller site is &quot;just parking&quot;, what it really does is in many peoples' minds is provide park-related parking for the soccer fields during peak summer evening and weekend usage--then when the lots are sitting empty during business hours the university gets to use them as a SECONDARY use. If those lots go away, there will be massive parking crunches during peak soccer times. Sun, Feb 12, 2012 : 4:49 p.m.
premise 1. how many employees in a few offices justifies the magnitude of what you are proposing. when employees get paychecks they usually get an automobile. aren't there plenty of offices avail elsewhere? premise 2. footballers usually come in with at least a small group....they arrive in vehicles as witnessed on roads beginning at 9-10am. I would put money on the fact that for 3-4 people buying a train ticket, they ride cheaper in a car, can transport ice chest/blankets, etc much easier as well. premise 3. why isn't their some vendor/retail at the bus station enlargement plan according to your theory on this . Sun, Feb 12, 2012 : 4 p.m.
Mr. Taylor: Please listen to the citizens, and stop trying to violate city parkland sale charters and federal funding regulations. Were you trying to pull the wool over the eyes of the Feds that UM spending on parking unrelated to the station counted as a local match for a station? By that logic, we may as well say that UM spending on Mott Hospital counts as a local match for the station. Regardless of that, you have not convinced the citizens that there is any real value in moving the station from it's current location to Fuller Road. In fact, all communication from you and the mayor seems to ignore the fact that we have an existing station, and instead talks about how rail travel is a good thing. While ageeing that rail is great, I would argue that the existing location is better because it (a) has easier access to M-14 and to downtown and (b) allows for adjacent development. All the great train stations of the world are in the middle of downtown shopping and office centers, and being sandwiched between a hospital and a soccer field doesn't really provide the same benefit. The only benefit to the Fuller Road location is to employees of UM hospital -- but it is actually worse for downtown employees due to the traffic in the area. I agree in part with Ranzini's proposal for retail and office development with the station, but would instead prefer to see it on the Michcon site adjacent to the current station. Has the City studied this location at all? If the station bridges both sides of the tracks there would be easy access to Broadway (leading to the Med Center and Plymoth Road) as well as to Depot St (leading to M-14 and downtown). I know we (the City taxpayers) don't own this land yet, but couldn't we work out a deal with a developer to cover most of the cost of this expansion, and manage the non-station part of the project? I imagine rent from offices, stores, restaurants, and hotels could cover quite a bit, and still give us a great station. Sun, Feb 12, 2012 : 3:58 p.m.
SLR &amp; VA- Thank you for your grasp of city issues and enthusiastically exercising your freedom of speech. I sincerely believe that all the dissenting opinions on this blog helped play a small part in the decision to halt the parking garage at Fuller Park. If city council feels compelled to continue (for whatever personal reasons) with the train station concept (for which no local commuter service exists - except within the $250 million county wide transit plan pipe dream ) then you are absolutely correct that a vote of the people is justified. This November, there should be a Fuller Station millage request to help pay for any additional expenditures related to the project. Over $3 million has already been spent from the various city buckets. It's time to ask taxpayers whether they support continued use of city financial resources for the train station concept. Personally, I think the location panders too much to the university when the existing station is still functional and sits next to an abandoned industrial site (Michcon) adjacent to huge retail potential on both sides of the tracks (North Main and Broadway areas). Troy's new train station design (with pedestrian bridge) would work well at the existing site and costs far less (if federal dollars magically reappear ). <a href="http://www.theoaklandpress.com/articles/2012/01/18/news/local_news/doc4f1628d0ac2ab951557225.txt" rel='nofollow'>http://www.theoaklandpress.com/articles/2012/01/18/news/local_news/doc4f1628d0ac2ab951557225.txt</a> Council needs to address the question of a vote sooner than later. If they refuse to put Fuller Station on the November ballot, then those up for reelection should be voted out! Sun, Feb 12, 2012 : 7:40 p.m. The majority of Ann Arbor voters love this bunch. They will never, ever lose their positions or be voted out. I have faith that the majority of Ann Arbor voters support the efforts and actions of this bunch. We need to quit complaining. It is not doing any good. Sun, Feb 12, 2012 : 3:48 p.m.
Is Christoper Taylor, a City Council member representing Ward 3, also so out of touch that he was expecting millions from a federal agency, yet he, too, can't even name it correctly. It is the Federal Railroad Administration, not &quot;Rail&quot;. If he is not sure who, it is little surprise that he missed the &quot;what&quot; and the &quot;when&quot; and the &quot;how&quot;; the timing of this ill planned deal. He is very eager to have commuter rail, often over looking details in his haste. What other details will he overlook? He along with mayor John Hieftje and the city council have already cost the city millions. Yet he wasn't to spend more of our taxpayer money on a project that he doesn't understand with an agency that he can't even name. Wow. Overlooking details can cost the public money, or lives, or both. We need a vote on this proposal, not have it forced upon us as the BIG DIG was. This would have the side benefit of airing anyerrors prior to real money being wasted. Sun, Feb 12, 2012 : 7:37 p.m. He is following in the footsteps of other city leaders. Jump, then try to wiggle out of any mess created. Sun, Feb 12, 2012 : 3:23 p.m.
Any new transit station should be small and inoffensive. It should not be large and mixed use. Maybe it could be designed using Victorian train station concepts. Modern utilitarian and ugly designs should be rejected. People care more about esthetics in projects than anything else. Sun, Feb 12, 2012 : 11:44 p.m. Since I'm sensing a bit of insincerity in your comments, I'm just wondering: If forty-million dollars gets you what's in the picture, how much more needs to be spent to make it an attractive, comfortable, and functional place to visit? And I know it's off the table for now, but it's just a rhetorical question. Sun, Feb 12, 2012 : 12:22 p.m.
Sun, Feb 12, 2012 : 12:10 p.m.
With the withdrawal of U-M from the project, the city can come up with the cash to fund the required matching funds, IF they thought in a financially savvy way. Selling the air rights to build a tall building over the Fuller Road Station parking structure would yield a very large amount of money (think $10 million to $20 million) and create a large ratable asset to enhance city tax base (the ultimate project could easily be $100 million in value), if it had a deed restriction that prevented it from being sold to a non-profit without a large property tax &quot;exit tax&quot;. The closest property near a high speed rail train station is by far the most valuable. The current plan contemplates using 100% of that extremely valuable real estate only for - parking cars. Ouch! The $100 million tall building above the high speed rail station could have medical offices and residential condos. You could then add location focused retail on the ground floor (for example, convenience store, pharmacy &amp; coffee shop). With the planned skywalk directly into the hospital from the train station, it would be a quick walk to the main hospital &amp; this would become the premium space for medical office space in the area because of its convenience for the docs (wasting time commuting between the hospital &amp; their medical office is very expensive to them since they can't bill sitting in a car). That means the building could charge premium rental rates per ft2 (which increases the value of the tall building). Also, it would drive ridership on the train for the many people who visit their doctor for follow-up visits to the doctor&quot;s office because of its convenience (just park, ride the train &amp; when you arrive take an elevator up). To do this, the city must design the project &amp; engineer the foundations now in a way to allow for construction of a tall building above the parking structure. You can't do this after the fact except in a very expensive way. Sun, Feb 12, 2012 : 2:51 p.m.
how would this all of a sudden become &quot;premium medical office space&quot; The Univ of Mich has built up numerous satellite centers in Ann Arbor and neighboring communities also with lab/radiology/therapies/same day surgeries-these centers are modern/up to date, and I had not heard they are limited in space/function in any way. Isn't there already office space in Ann Arbor? What are the facts for your main argument? Sun, Feb 12, 2012 : 11:56 a.m.
Where is the poll question, &quot;The Fuller Road project ought to go to a vote of the citizens because no one can assert with a straight face that they will spend $121 million building it &amp; that it will ever be parkland again!&quot; Personally I support the project in concept but NOT if the voters don't approve it first. If it's a project with merit, sell the citizens on that &amp; if you can't convince the citizens, respect the democratic process and move on to other topics. Sun, Feb 12, 2012 : 11:44 a.m.
Can't be hip and groovy and all for public transportation and its far outness and be too cheap to pay for it can we Ann Arbor? Sun, Feb 12, 2012 : 10:55 a.m.
As I have stated many times before, this is another example of our leadership chasing personal projects. Instead of leading our city to eliminate waste and reduce costs, they are chasing train stations, parking garages and art. Not the type of leadership that we can brag about. In fact, we should be embarrassed that this is what we elected to lead our city. Sun, Feb 12, 2012 : 4:18 a.m. I like the idea of being able to travel by train. But with a family of 4, right now, it's too expensive compared to driving. Someday when gas (plus parking) actually does become more expensive, I'll reconsider. So I don't mind waiting a bit longer to make sure that the location and design makes more sense to me. If we are going to go with an upgraded train station, let's make it an actual destination instead of a parking lot in disguise. A cafe with affordably priced sandwiches and snacks, maybe even beer and wine to consume while enjoying a view of the river while waiting for the train to take us away or deliver a visitor from ouf of town. Can we consider placing a station somewhere along North Main looking out onto Argo Pond? If we are going to spend millions of dollars on a building, can we consider purchasing some of the ugly buildings and former industrial sites on this stretch of road? Mon, Feb 13, 2012 : 10:58 a.m. Explain to me how something that doesn't work financially can go down in cost by adding an expensive train station into their overhead. Oh, I forgot, it's the governmetn and they have this amazing way of calculating the cost of something using science fiction and magic. First, why do we have so many rail improvement opponents in Ann Arbor? This is a frightening development. Second, high-speed rail service coming to Southeastern Michigan. It is a done deal. High speed and reliable rail service makes economic sense and is also one of the many strategies to bring back parts of Detroit. Ambassador Bridge owner, Manuel &quot;Matty&quot; Moroun, is aware these developments, Detroit City Council as well and countless other municipalities are rallying behind the plan as well. The only question for Ann Arbor is whether Ann Arbor and the mighty U of M can get it together to collaborate and share the costs, or lose out completely! Sun, Feb 12, 2012 : 7:35 p.m.
Let's also tone down using salad in any comment. It's making me hungry. Sun, Feb 12, 2012 : 7:33 p.m. Yes! If true, anything that the Detroit City Council supports is good for me. They rival our city leaders for the best in the state. Just look at their track record leading Detroit. I wonder if they like art? Sun, Feb 12, 2012 : 4:55 p.m. I think you're misunderstanding what a red herring is. Because in this situation, it's the weak attempts to justify the expense of this station. All the things I put forth actually have video/audio backup; my point is that even the biggest proponents of this thing can't dredge up anything that would remotely serve as justification for this. That's happening. The red herrings are things like Amtrak being in favor of it, or it &quot;being an exciting time for rail.&quot; And who are you talking about who has deep pockets that would not want this station? What big rich group has said they're against it? As was PAINFULLY clear, U of M wanted this project to happen, and my guess is that it was their influence that kept money pouring into it against all logic, reason, and public input. I have very shallow pockets, and I would expect that anyone who pays the EXORBITANT Ann Arbor property taxes would be just as displeased with this debacle. Opponents with deep pockets against high speed rail? What? U of M has the deepest pockets and most influence of anybody you're going to get an opinion from on this, and I think that's why we're already a few million in the hole on it. If U of M was kowtowing to any financial contributors who were against this, it never would have made it past 2006. Ms. Lady: How does replacing an existing train station with a new one buried in a giant UM parking structure in a city park benefit high speed rail? Do we want our new station to be hidden in an ugly parking garage with no potential for adjacent development? Sun, Feb 12, 2012 : 3:29 p.m.
Oh Boo hoo. I'll be a driving! Sun, Feb 12, 2012 : 2:38 p.m.
A true HSR system achieves speeds in excess of any seen here in the US and by factors greater than two. The global average of installed HSR systems is 186 mph. The US DOT defines HSR as 125 or greater sustained speed. The only HSR system tried here in the US was a failure. Why has such a great nation as ours failed in HSR. One reason; we are married to our cars and trucks! So described above by Sam. We even break the law doing so at break neck speeds, and all the while spewing out air pollutants. Second to build a correctly designed system requires money and lots of it. Why? We can't use the existing track for HSP, nor are most existing rail corridors wide enough for the additional track lines needed for a proper design and track. Unfortunately our country is broke! We could build a proper HSR system for sure (layered over or under the interstate highway system). We already owe 16 Trillion $! What did we get for it? We could have built a state of the art HSR across this country for the money we spent on make believe wars in Iraq and Afghanistan. Instead we will be driving down our interstate highways breaking the law and hope we do not get killed by somebody texting/talking on a phone while driving 80 plus MPH. Sun, Feb 12, 2012 : 3:15 a.m. Your analogies are mixed like my salad! Seriously, we all know what this is about. Really. You can pull out every red herring, Mr. RUkiddingMe but ultimately this is about certain groups with the deep pockets unhappy about a multi-modal station including a parking structures walking distance to the biggest employer in Ann Arbor. Opponents of high-speed rail services that perhaps give generously to University of Michigan Dearborn, Flint, and Ann Arbor! Sun, Feb 12, 2012 : 3 a.m.
First, Lady, being against a non-paid-for gargantuan wasteful poorly-thought-out boondoggle being dishonestly forced on us under the guise of public transportation is not being against rail. Second, no one is against, as you say, &quot;high speed and reliable rail service.&quot; But high speed reliable rail service doesn't make sense in a vacuum. I think food makes sense, too, but I'd be against someone using my money to demolish a barn, remove 6 feet of dirt, truck in 6 feet of other dirt, and plant corn, when there was a fertile lot twice the size across the street with corn seeds already. Just saying &quot;high speed rail&quot; and assuming that whatever the plan is MUST make sense is kind oif what's going on here, except I expect there's a little more impropriety involved than innocent mismanagement. And Detroit City Council is for us building a new train station within earshot of an existing train station? That actually doesn't surprise me. If we keep letting stuff like Fuller Station absorb millions, we'll soon have a lot in common with Detroit. Sun, Feb 12, 2012 : 2:19 a.m. I like the grass field that's there right now better. Sun, Feb 12, 2012 : 12:13 a.m.
Just some thoughts about what this means: After wasting money on designing a train station that looks like a 1300-space parking deck, we will need to go back to the drawing board and spend more money on engineering. Without access to U-M money, the new train station will look like a 300-space parking deck. It won't get built anyway, Amtrak will stay where it is, which is just fine. That precious Fuller Road &quot;parkland&quot; will continue to be used as a gravel parking lot for the next thirty years. At least the utilities were upgraded, but probably years before they needed to be. Sun, Feb 12, 2012 : 12:11 a.m.
You must believe me when I tell you I hate posting so many times in so short a time, but I thought it worth mentioning that the mayor, in just one of his many public pushes for this, sent out a leter (I would like to know how that mailing list was generated, by the way; I did not get one) that touted, among other things, the fact that Amtrak was in favor of this. Really? That's just so amazing, since they would pay not one single dime for the whole thing. So they get a new station for free, and they're behind it? What a massive incontrovertible proof that we should do this, right? Did you check to see if they would ALSO be in favor of adding more parking and reonvations/expansions to their EXISTING station for absolutely free as wel? Or would they only want a free station if it was new and a couple blocks away from the one they currently have? Does it seem odd to anyone that we're paying hundreds upon hundreds of thousands of dollars to preserve green space, and yet we're going to spend hundreds of millions on a transit station on a park? When there's a huge vacant lot next to an existing station, which is NOT a park? Everyone should sit and think for a minute about how council and the mayor continued to spend and spend and spend on this, without knowing if it would ever come to fruition, without knowing if it would ever have decent justification, and without needing to get any kind of OK from the citizens' vote. And soon they'll pull out the &quot;well, we've got so many millions in it already, it would be a shame NOT to do it,&quot; and there will go your good money after bad. Mon, Feb 13, 2012 : 1:08 p.m. I get a kick when the city ecides to lease it to U of M so they don't have to have voters approve it, like there's some possibility of restoring it to a park with a hundred million dollar train station on it. Look, I know a lot of it's paved, but the fact remains; it IS a park. Just because a lot doesn't have an office building doesn't mean it's not zoned for business. The zoning is about what land CAN be used for, not necessarily what it currently IS being used for. And the point is still valid regarding why we put millions into buying nothing but development rights to maintain lack of development, but then plan this thing for land that's zoned as park land. It's completely ridiculous. Mon, Feb 13, 2012 : 12:46 a.m. I get a kick when people call that a park. Sun, Feb 12, 2012 : 12:02 a.m. Continued... 56 minutes 25 seconds: a study resulted in a decision against funding and a recommendation to NOT pursue this, as ridership did not justify it. So the solution was to do it ANYWAY as a &quot;demonstration project&quot;, to PROVE that regardless of the study, we needed to do it. That's right, they were told there was no evidence that this was feasible or necessary, and the decision is to do it, and relying on the resulting ridership to prove that we DID need to do it. 1 hour 48 seconds: to justify perceived need for the station, they cite an economic forecast that over the next 30 years Ann Arbor will have 18,900 new jobs, but only 1800 new residents. So they need to have mass transit to supply transportation for all these people (who won't drive because of the previous assumption that this station will have everyone biking and bussing and training; you know, from that detroit/lansing study ten years ago that showed &quot;interest&quot; from Lansing to Detroit). In other words, disregard the study that said this is not feasible, but put all their faith in the study that shows a grand assumption about this enormous influx of jobs/workers over 30 years. 1:09:09: They're not sure, but the MIGHT be able to charge Amtrak users parking, and IF SO, charging Amtrak parkers will help pay for the project. Really? Charging parking for 150 spaces will pay off this project? In what, like 400 years? Assuming no maintenance is needed for all that time? They don't know who would staff it. They don't know who would be responsible for it. They don't know where the money's coming from to do it, OR how it could pay for itself. They don't know if anyone needs it or wants it. It's a train station 200 yards away from an existing train station, which, by the way, sits adjacent wo one of the biggest vacant lots in the city. They are stealing your money, citizens. Right in front of you. Sat, Feb 11, 2012 : 11:58 p.m.
1) People should begin demanding a full accounting of every dime that has been spent on this project, INCLUDING things that they said &quot;needed to be done anyway,&quot; but were clearly for the new station. It is well over multiple millions. This has gone beyond mismanagement; this is dishonesty and criminal negligence. 2) We are watching Ypsilanti's Water Street debacle unfold before our eyes here in Ann Arbor. Fuller Station is Ann Arbor's Water Street. It is council people and a mayor having too much money, spending even more than that, all because some of them assume this must be a great idea. For DECADES, the Ypsilanti taxpayers will continue to have their backs bent with more and more tax to recover from THEIR council's insane waste. 3) The fact that this station is the most poorly thought-out, most egregious intentional dishonest waste of your hard-earned money is best proven by the fact that the biggest cheerleaders of it continue to push for it and spend money on it, yet have ZERO justification for it. I encourage people to watch/listen to some of the questions and answers about this at the meeting in Feb 2010: <a href="http://a2govtv.pegcentral.com/player.php?video=d8702a5185a6d048ec57970dcfcce765" rel='nofollow'>http://a2govtv.pegcentral.com/player.php?video=d8702a5185a6d048ec57970dcfcce765</a> 49 minutes 24 seconds in: Question was what evidence there was that this station will have people taking buses/trains instead of driving; answer was that around 10 years ago there was a study that showed &quot;interest&quot; in a train from Lansing to Detroit 52 minutes 45 seconds: need for parking was defined as Amtrak having 75 parking spots now, but they projected to &quot;possibly&quot; need 150 by 20 YEARS from now. They are supporting this tremendous enormous expense for 75 spots over 2 decades? Mon, Feb 13, 2012 : 1:05 p.m.
Mick, can you specify something that hs been very reacted to because it was so scandalous? Several A2 residents I've spoken to didn't even know about this plan. Lots of terrible ideas have lots of money wasted on them without being halted/avoided by public outcry. It actually happens quite frequently. The problem is that the outrage and publicity come too late. The scandal breaks when the money's gone. I believe a lot of what gets money spent counts on the trust, apathy, and/or ignorance (as in not immediately awareness) of the citizens. Did you watch the video I posted a link to and listen to the answers to those questions? How can you defend millions of dollars being spent with that kind of planning/lack thereof? Mon, Feb 13, 2012 : 12:45 a.m.
You claim a lot of bad: &quot;The fact that this station is the most poorly thought-out, most egregious intentional dishonest waste of your hard-earned money is best proven by the fact that the biggest cheerleaders of it continue to push for it and spend money on it, yet have ZERO justification for it.&quot; And many folk posting here are upset with this plan. But I must point out that if this is as scandalous as you suggest, that is not the opinion of the majority. When a major goof is being promoted, people do react. But it appears the elected officials do not feel enough negative pressure to cancel this project. I think the amtrack only has those 75 suits but if you look up amtrack parking on google, you'll find something like 146 nearby parking spots, so the availability for 20 years from now is already there. Sun, Feb 12, 2012 : 3:49 p.m.
Is Christoper Taylor, a City Council member representing Ward 3, also so out of touch that he was expecting millions from a federal agency, yet he, too, can't even name it correctly. It is the Federal Railroad Administration, not &quot;Rail&quot;. Sat, Feb 11, 2012 : 11:26 p.m.
Time to stop using that file graphic. We don't know what the plan for a multimodal station would look like. You are showing the parking structure. Mon, Feb 13, 2012 : 4:55 a.m.
with regard to the graphic. 1. notice how the image of michigan would have been of a parking lot and not the hospital. 2. are the cars idling? 3. are the cars waiting for the pedestrians?